Thomas Becket (sometimes called Thomas à Becket), the son of the sheriff of London, was educated in Surrey, London, and Paris. His parents died when he was twenty-one, and he went to work for a relative in London. About three years later, Thomas joined the household of Archbishop Theobold of Canterbury. Already trained in law, Thomas was sent by the archbishop to Rome, Bologna, and Auxerre to study canon law. Thomas was ordained a deacon in 1154 and nominated by Theobold as the arch-deacon of Canterbury. There he quickly became a favorite and close friend of Henry of Anjou, soon to become King Henry II of England. The king made Thomas the chancellor of England in 1155. Next to the king, Thomas was the most powerful man in England and became famed for the luxury and magnificence of his life style. Yet he was also known for his generosity to the poor and greatly assisted Henry in formulating the reforms in the justice system that were instituted during his tenure. Upon the death of Theobold in 1161, the king nominated Thomas to be archbishop of Canterbury. He strenuously objected and refused the position until told by the Holy See that he should accept the nomination. Thomas warned Henry that naming him chancellor would undermine their good relationship; indeed, this proved to be true. 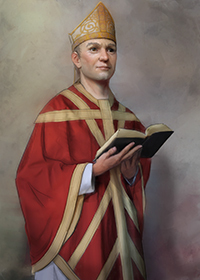 Upon election, Thomas resigned his position as chancellor and was ordained a priest on the day before his consecration as archbishop in May 1162. As archbishop of Canterbury, Thomas Becket's life changed dramatically. He undertook an austere style of living, monastic in practice. He wore a hairshirt under his cassock, and devoted much of his time to prayer and the study of Scripture. He became a strong church leader, often taking positions which brought him into conflict with the king, something he had warned the king about before his nomination. One of these conflicts occurred when Thomas rejected the Constitution of Clarendon which effectively gave the king power over the Church. Thomas was forced to flee to France for safety. After several years of acrimony between Thomas and the king, a reconciliation of sorts took place. Knowing that it would almost certainly mean his death, Thomas returned to England in 1170 from his exile in France. Shortly after arriving in England, Thomas sent letters of excommunication to the bishops of London and Salisbury, and a letter of suspension to the archbishop of York. The three bishops immediately set out for France to seek an audience with Henry, who was in that country at the time. When informed of Thomas’ actions, Henry, who was given to fits of uncontrolled rage, cried out, "Won't somebody rid me of this troublesome priest!" While it is doubtful that Henry intended the death of Thomas, four of Henry’s knights took him at his word and, on December 29, 1170, murdered Thomas in his cathedral at Canterbury. Thomas Becket was at once proclaimed a martyr and, in 1173, Pope Alexander III declared him a saint. The following year, Henry II was forced to undergo a public penance for the death of Thomas in response to the demands of the general populace. Until it was destroyed by Henry VIII in 1538, the shrine of St. Thomas Becket became one of the most visited pilgrimage centers in Europe. The story of Thomas Becket became famous in our times by a T. S. Eliot play, Murder in the Cathedral. An optional memorial for this saint is celebrated on December 29. Thomas' message today: Thomas Becket is an excellent example of someone who made drastic life changes in order to follow his calling. Although his personality and methods could be offensive to others, he lived by what he believed was right. What are the causes and issues in our times that you feel are worth fighting for?